This campaign is dedicated to the memory of Garry Beebe. Great job with the decals Mark. I can't believe I haven't posted anything since October. Man did I really not look forward to putting those decals on those planes. Those decals were not the easiest to work with. 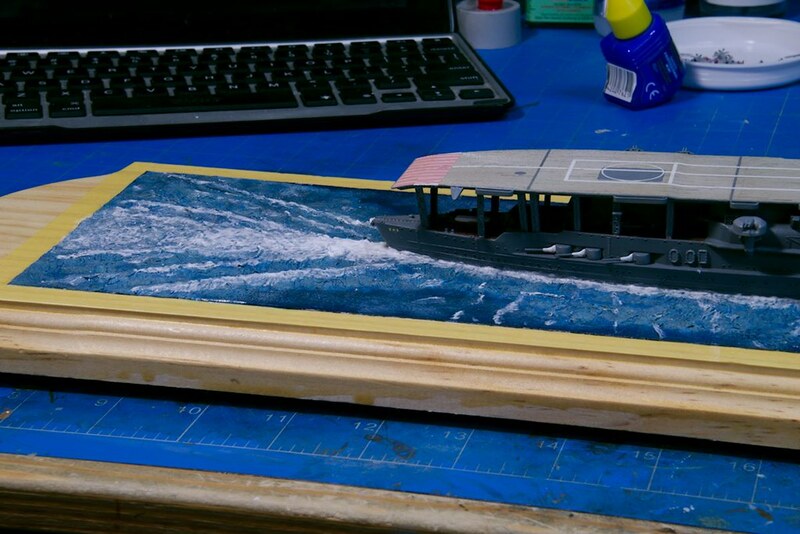 The film was much larger than the surface they were going on, forcing me to trim each one with an Exacto knife. 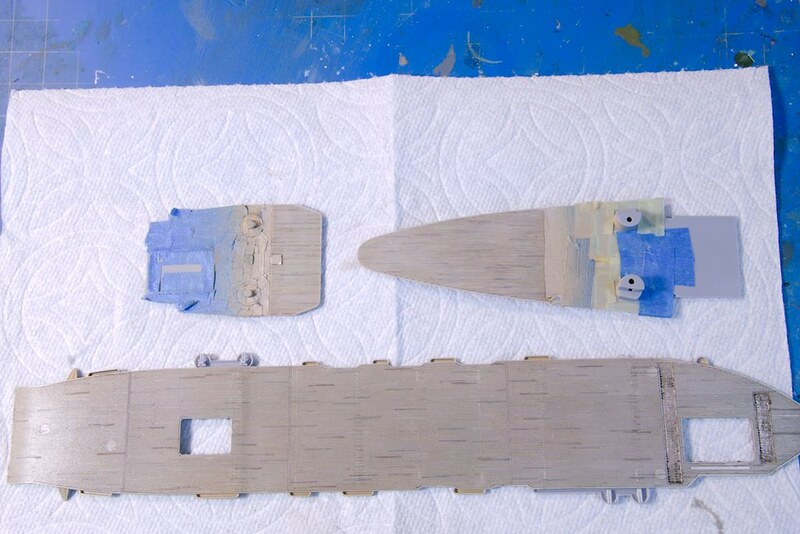 Getting the decals on the fuselage was a bear. It took a lot of Solvaset to get them lay down, but I got it done. Well as much as I am going too. 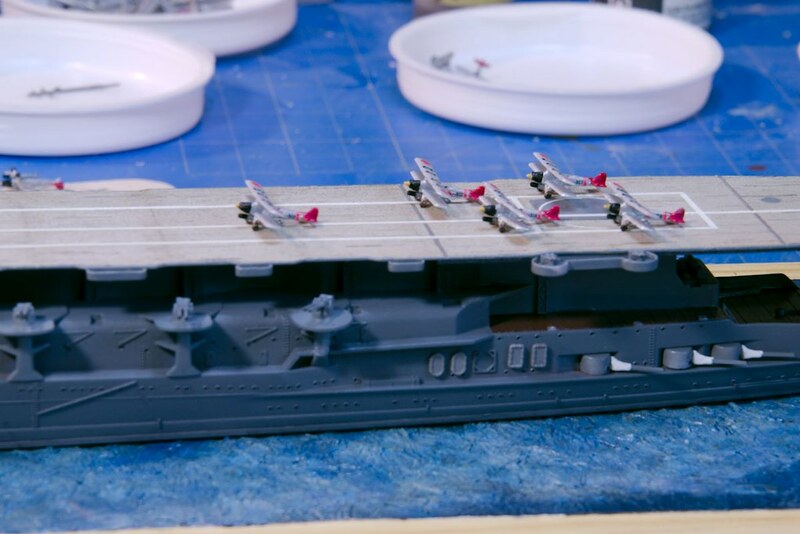 Anyway, as soon as I finish with the decals I started putting the planes on the flight decks. Adding the planes was the final thing to do on this build. Calling this one done. 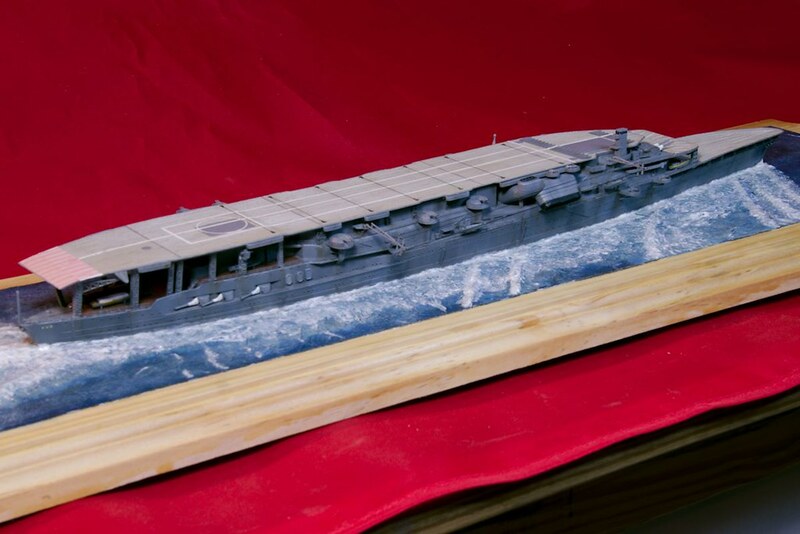 A few photos of the finish model. Wow, Mark, she's looking great! I just love that goofy little island structure. Now for those airplanes! Hat's off to you! 1/700 is way too small for my fumble fingers! Good luck with the decals on the airwing! Well this kit is finished, there isn't anything more to add to it except for the air wing. After the last post I realized that there are 11 decals per plane, not nine so I have to confess I been putting it off until the end. 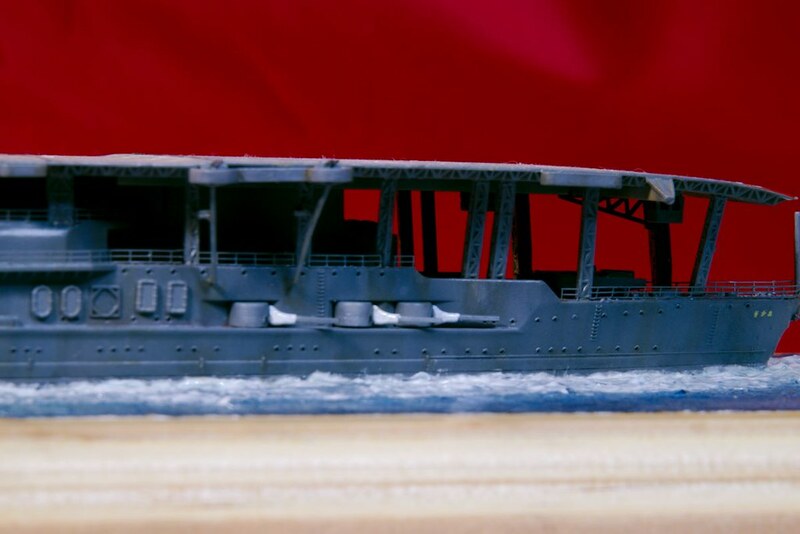 I finished adding all of the odds and ends, worked a little more on the water, installed the railings, antennas / wires and finished up with weathering and pin wash. I just have to add the flag and the air wing. The weathering was done with artist oils of black, white, burnt umber, blue, blue/black with 15 parts of turpentine to each color. Several random brushing of each color. 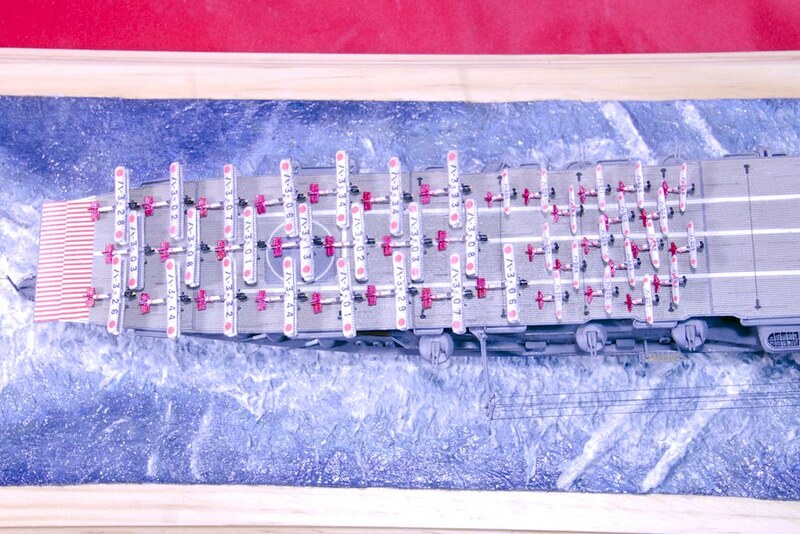 The arrestor cables were aftermarket, I believe Eduards. 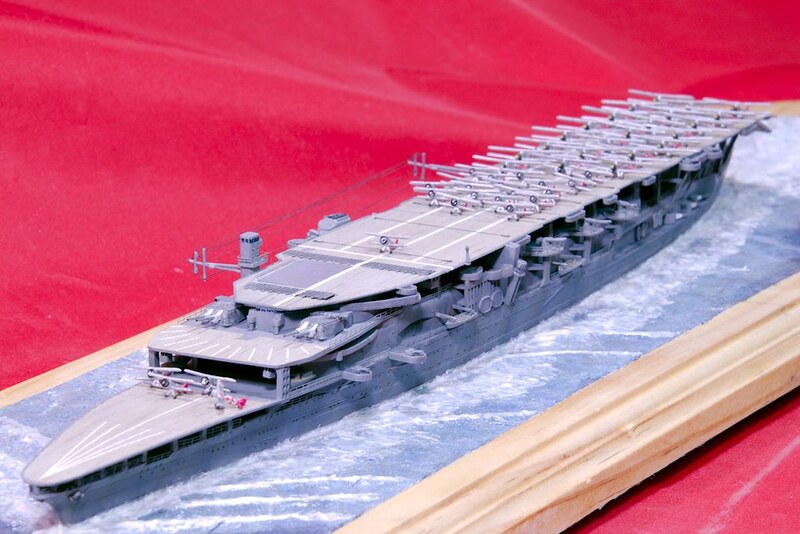 The next posting should be with the air wing on the flight decks. Only a couple of hundred 1/700 decals to go. Until the next post. Great water effects and setting. I have always secretly wanted to try this but haven't had the courage to take the plunge. 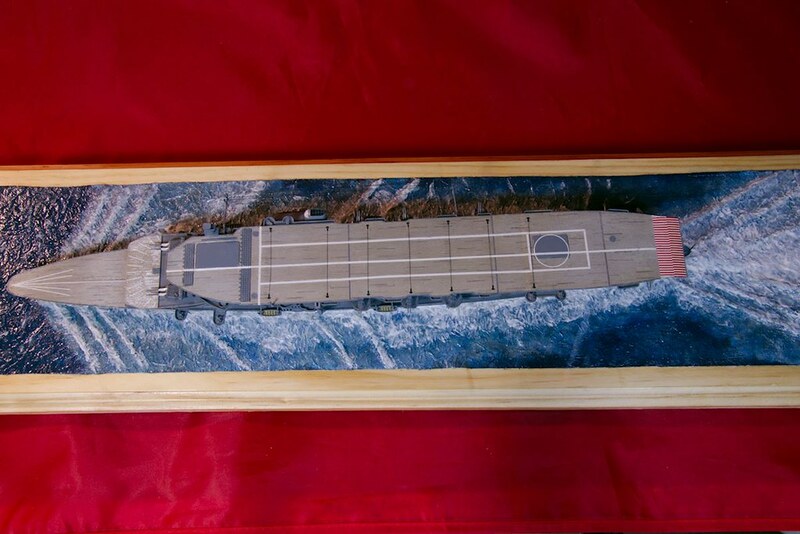 Looking forward to seeing the airwing in place. Thanks Michael, I still have more to do with the base. Making slow progress on the airwing but I will get there. 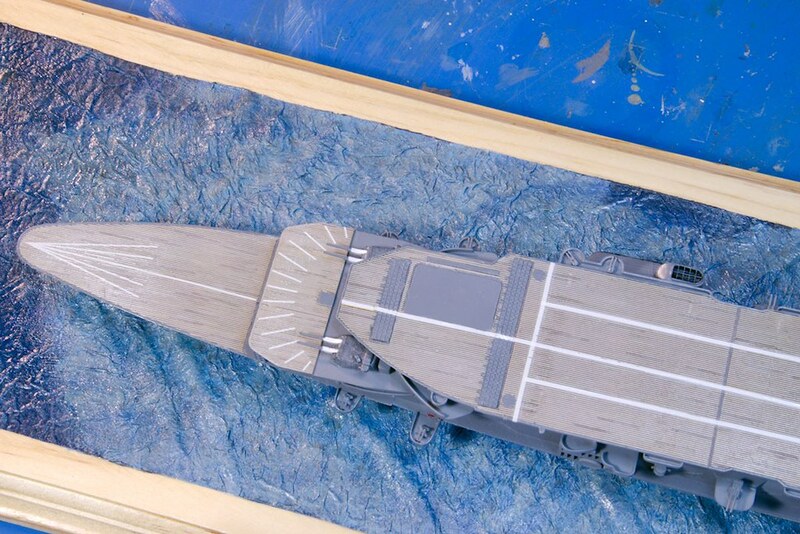 Mounted the hull to the base and then cemented the deck to the hull. First time doing a water base so this will be an experiment in trial and error. There are some touch ups to be made, railings to add and some odds and ends to attach. My goal is to finish her by the end of the month. Tim, I believe I can do a few photos. She's looking really good, Mark! 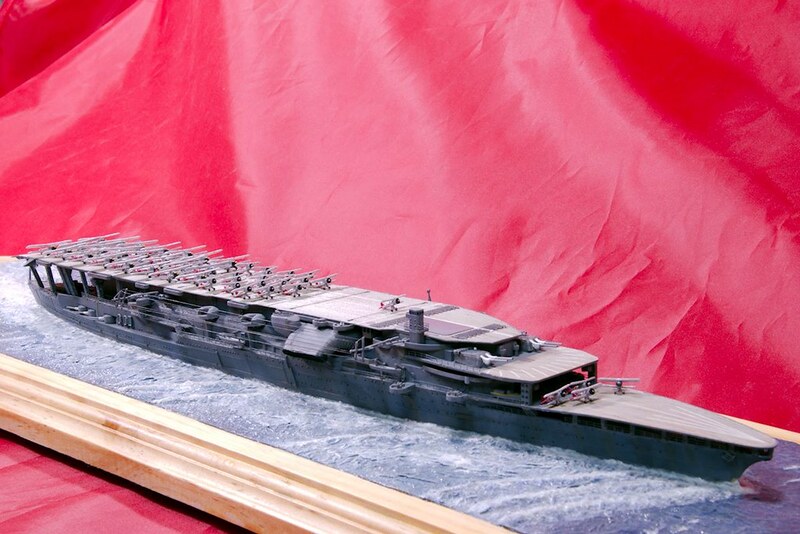 Akagi was at any time an unusual looking ship, but that three flight deck configuration was her weirdest look of all! 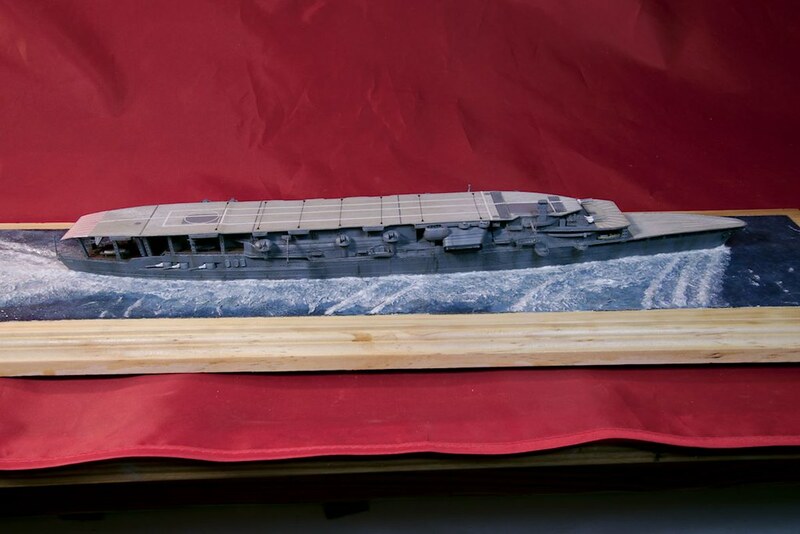 It certainly underscores how committed the Japanese were to naval innovation in the 1920s and 30s! 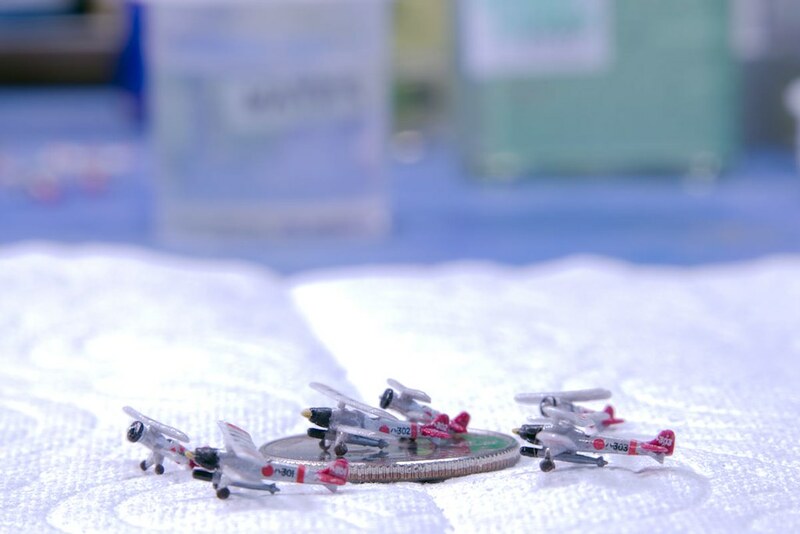 I look forward to seeing all those tiny aircraft come together. Can you post a few close-ups of them as you proceed? I'm very much enjoying the quality of your work! Wow, I can't believe it been almost a month since my last post on this build. 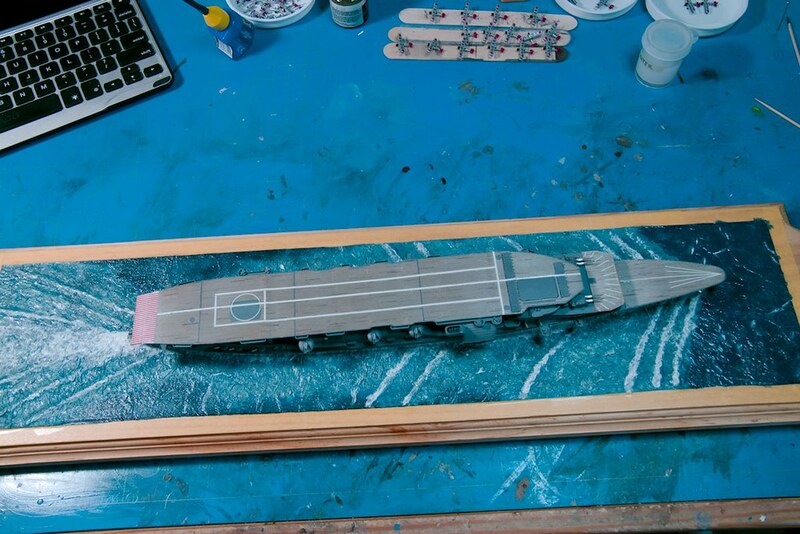 I have been busy as bee getting the ship ready, planes painted and creating the water base, my first one. Anyway enough of that here are a few progress photos. 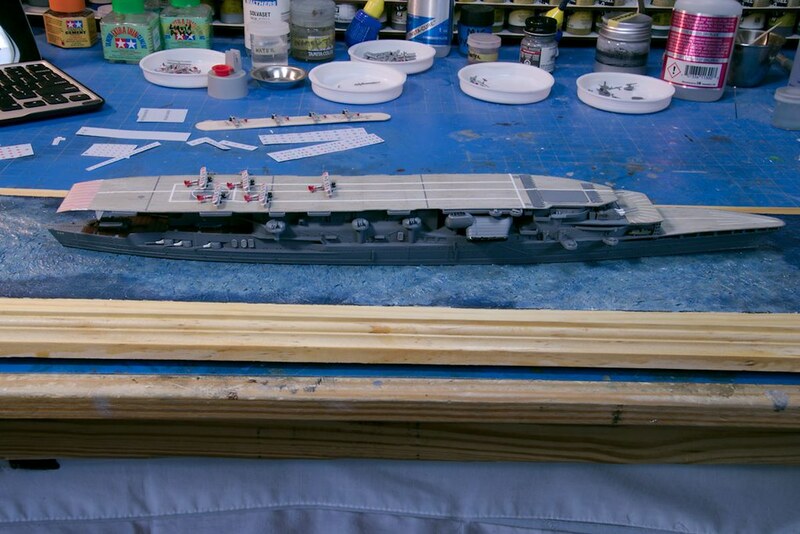 Portside and starboard side sitting on the base. 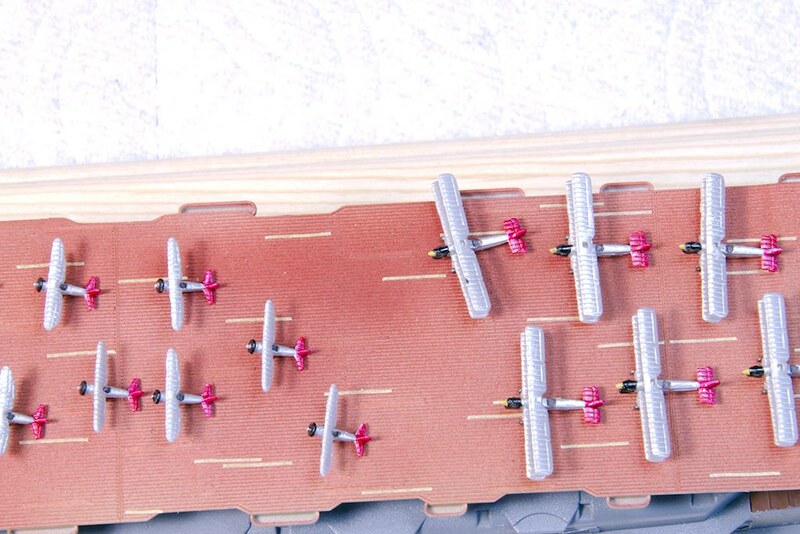 Here is a top down shot with 5 torpedo planes with decals. Each plane requires 8 decals. I haven't put the decals on the tail, that will be tonight. 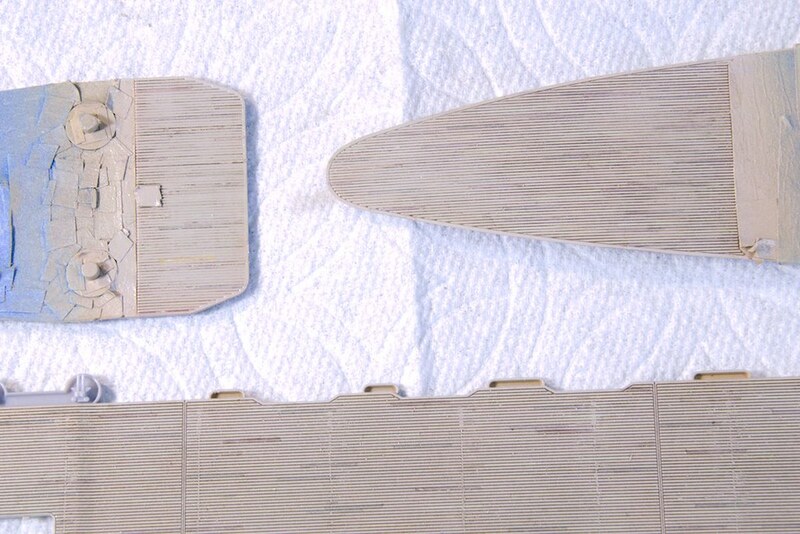 I had to be drunk or crazy when I order those additional planes. Only 49 more to go. This is my first attempt at making a water base. Its been a big learning curve for me and has taken most of my time this past month. 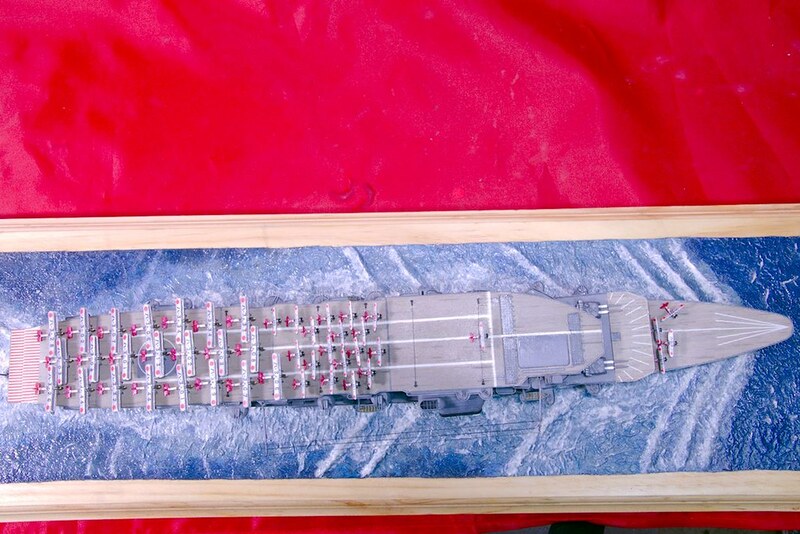 It is ready for me to mount the ship and then I will began to add the white caps, do some more blending and such. Well back to the decals. Until the next post. the decks looks great Mark! 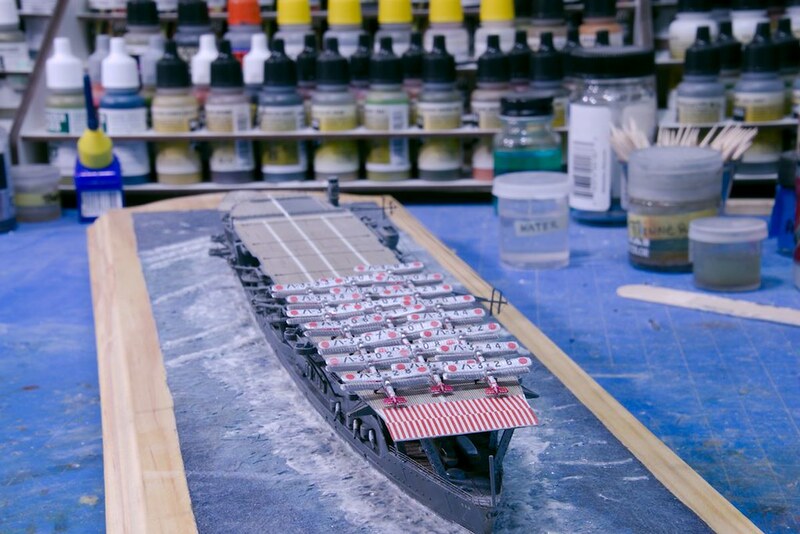 Finished painting the 3 decks with a top coat of Future for protection. 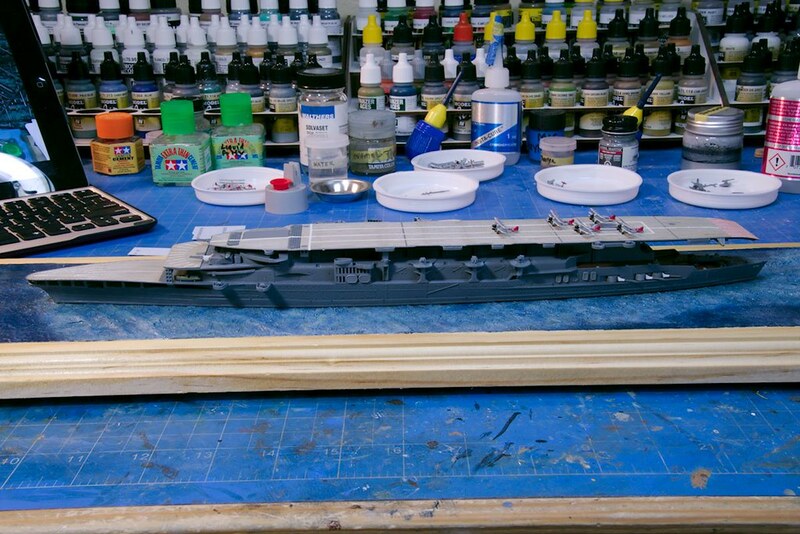 Next step is to cover the decks with masking tape so I can paint the metal parts grey. 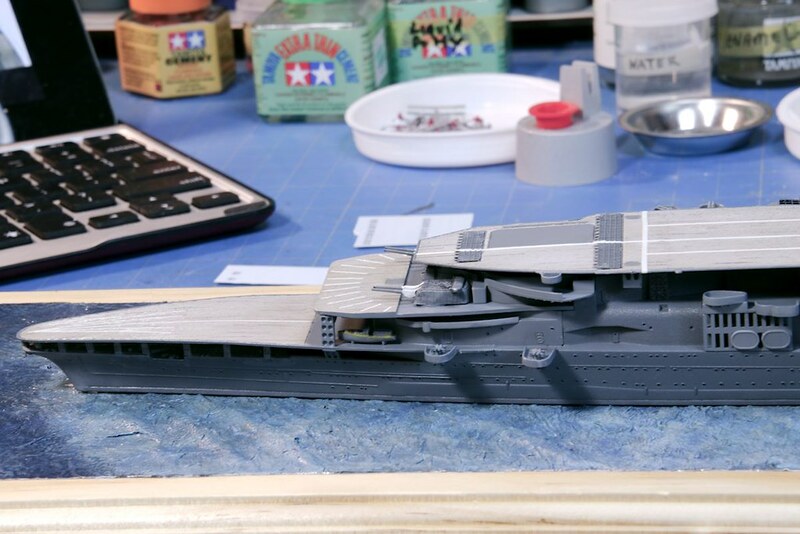 Also been busy with prepping all of the other parts that make of this ship. Added PE doors, ladders and exhaust stack caps. 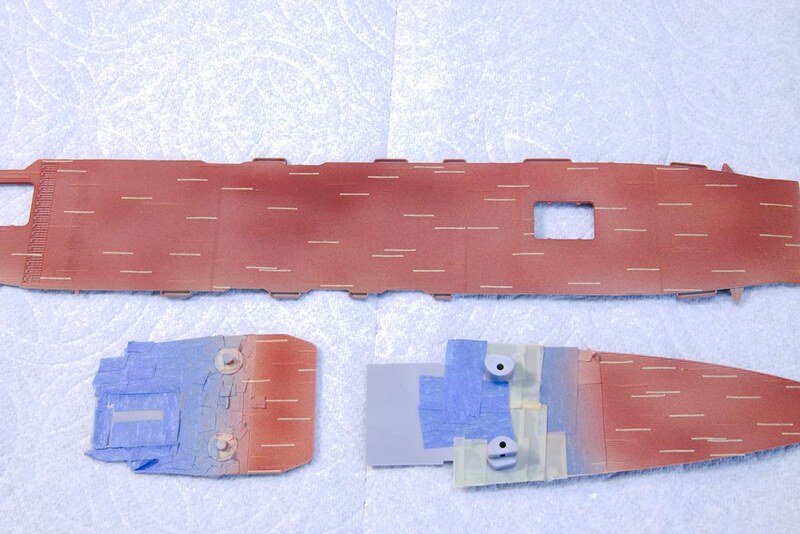 I finished painting these parts after I took this photo, so assembly should proceed quickly. 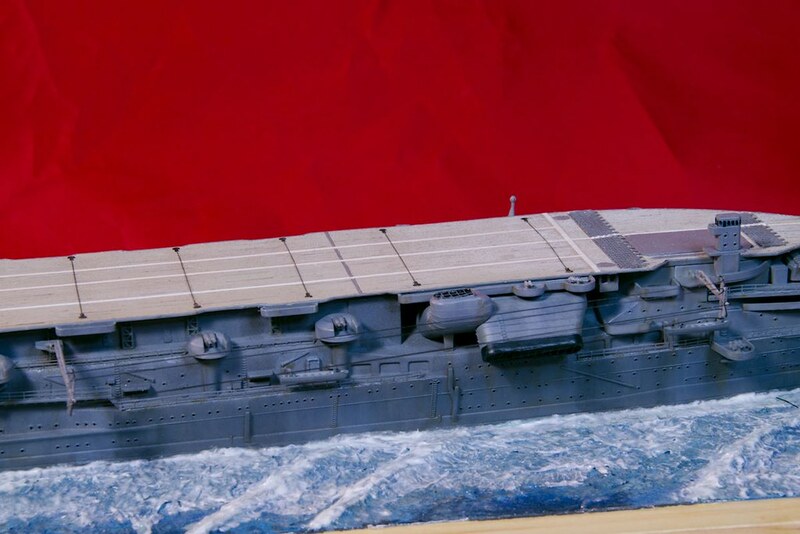 I haven't decided yet if I will use the PE flight deck supports or use the ones that came with the kit. 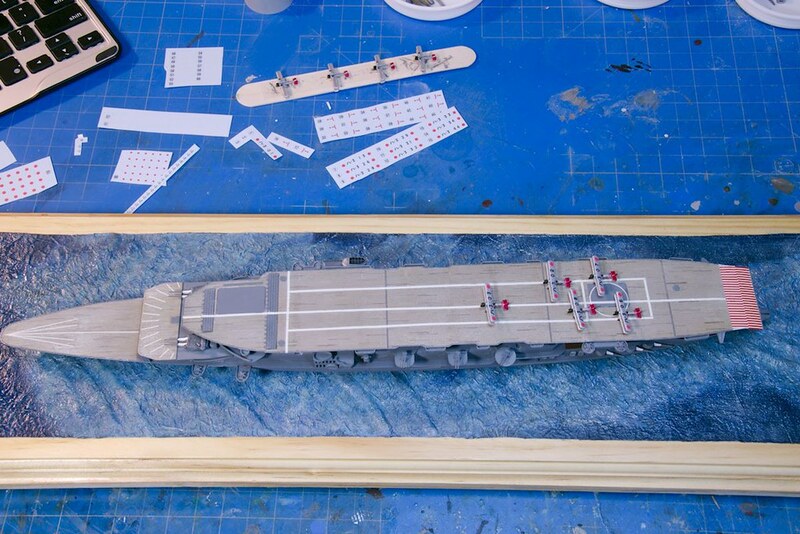 TOM's model works PE is so flimsy that I am afraid I will bend them up sitting the decks in place. I guess a couple of test fittings will help me decide. The deck looks great Mark. Always interested to see new styles for painting. The aircraft are looking good too. I don't envy you in this scale but do appreciate the way you are dealing with. I appreciate this build. I thought about ordering and trying this kit a year or so ago but lost my nerve. I am still a fan of 1/700. I Just need magnification! 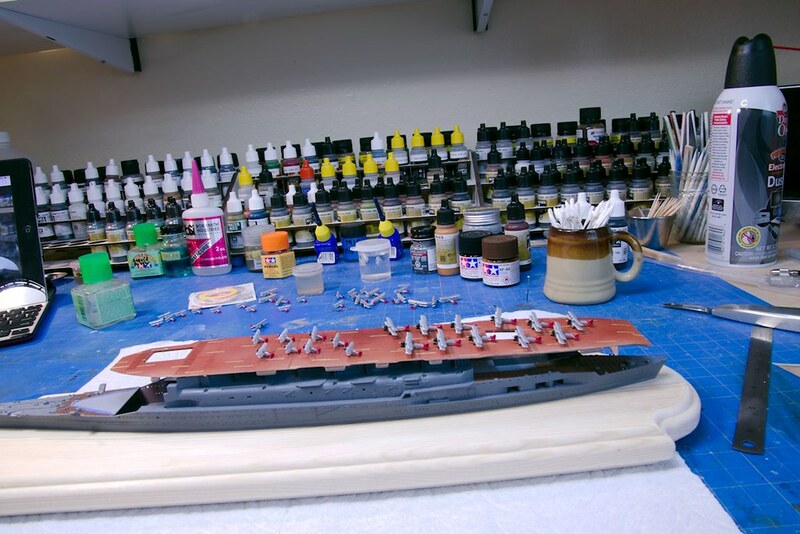 I like your multi-tone approach to painting the wood flight deck; I've never had much luck with that technique myself, so I'm interested to watch your progress! 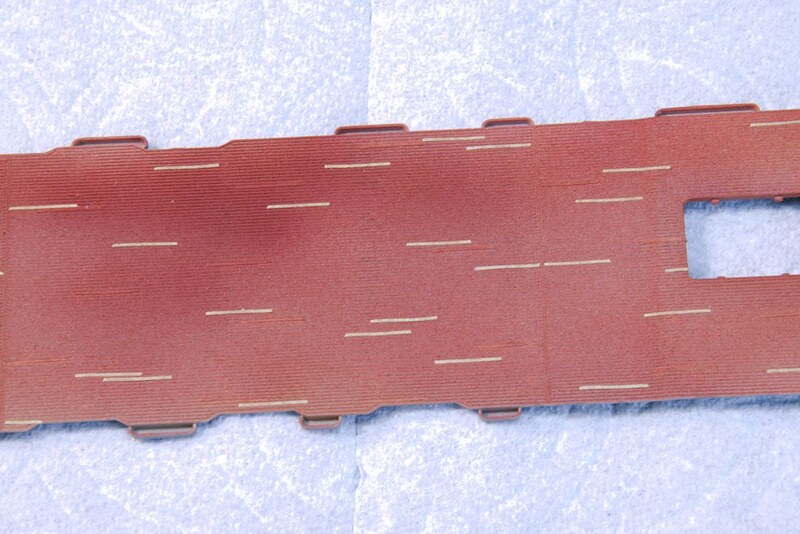 I have one more set of strips to lay follow by three more coats of paint, clear coat and wash. First time I tried this on a 1/700 model. I am completely winging it. Good luck with those decals, I am not a great fan of lots little decals. I have been making progress these pass few days. 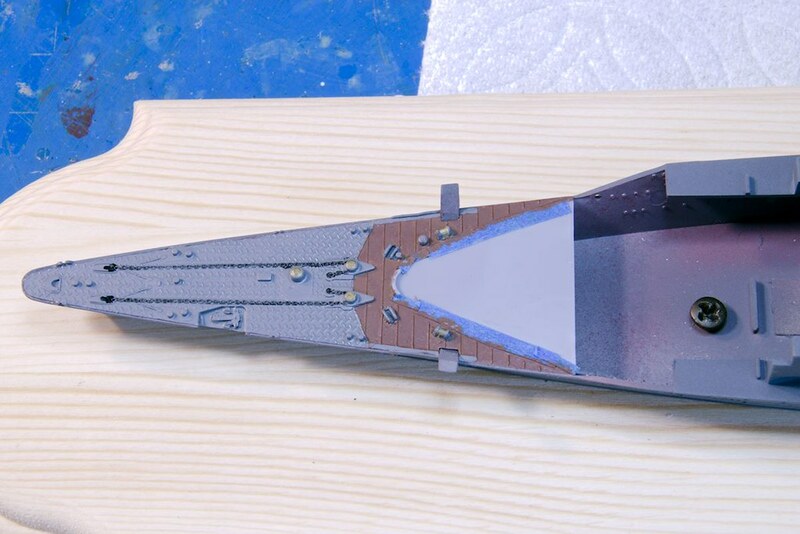 I put a couple of coats of (Model Master) Kure Grey followed with a couple of coats of Future to protect the paint. 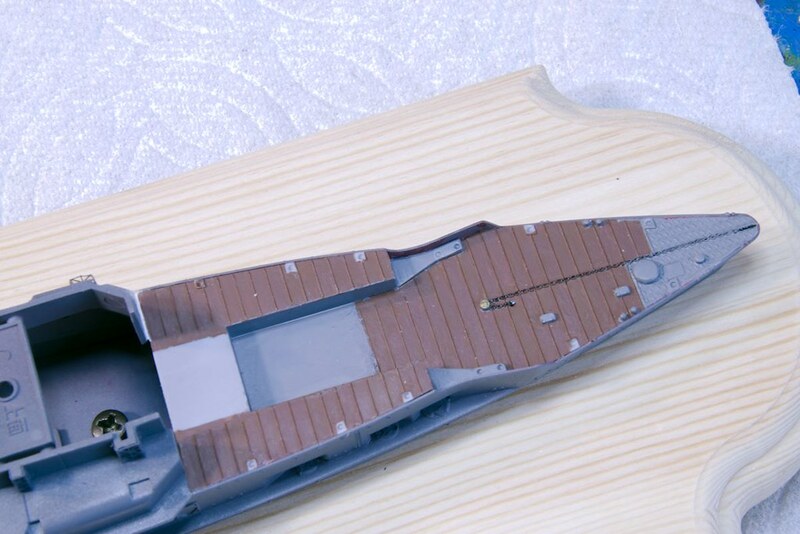 The bow and stern main decks have been painted and fitted on the hull. 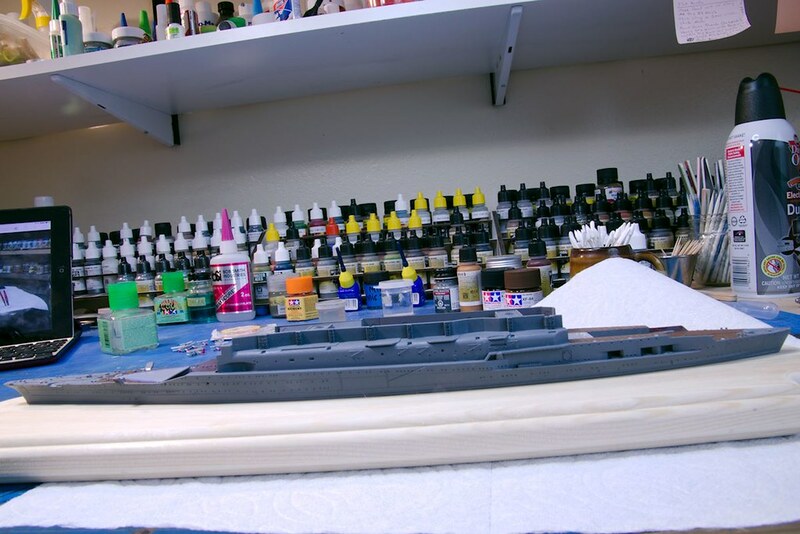 Started painting the three flight decks. The first attempt was a total failure. The paint wouldn't stick to the decks and the paint would come off when I pulled the (test) tape off (I don't think I let the paint cure long enough). 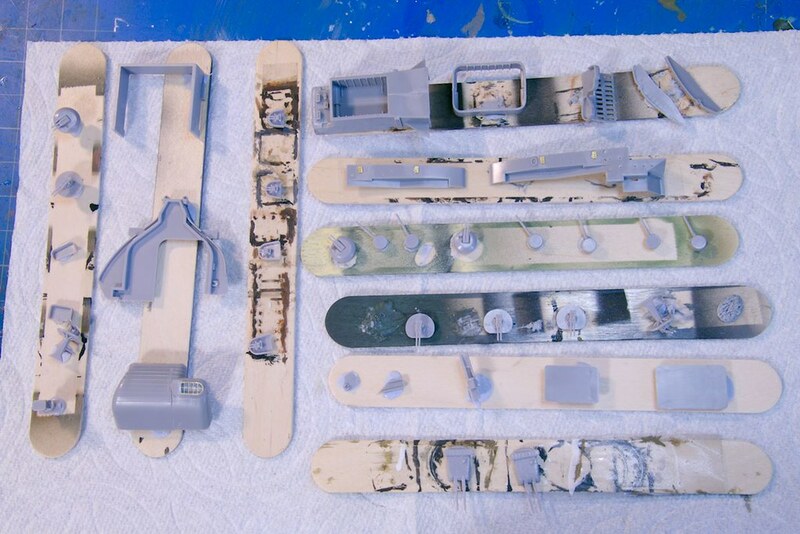 Remove the paint and re-primed (Vallejo White Primer) and let it sit for a couple of days. Then I added a random coats of Buff and Sandy Brown. 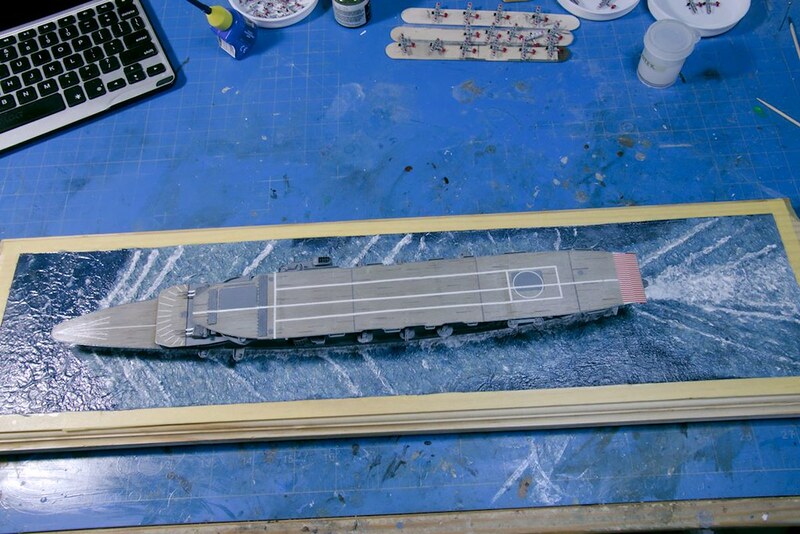 Lay .4mm X 9mm strips of tape randomly on the decks put on a coat of (Vallejo Model Air)Mahagony paint and added more tape strips randomly. Right after I took those photos I put on a layer of Medium Brown paint. I will let that sit for a full day and then add more random strips of tape. I have four more layers and colors to do, so this will take a week at least before I put the final coat of Future to protect it. 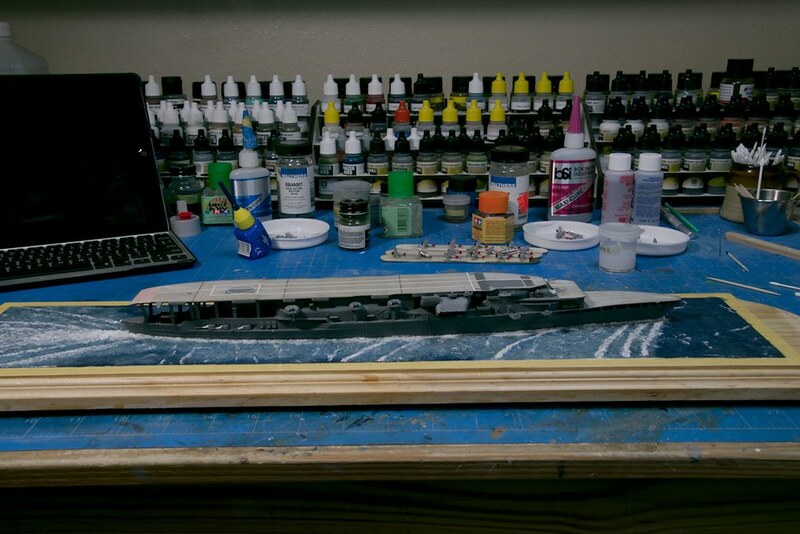 While I was waiting for the decks to dry I started on the air wing. They are all painted and have a layer of Future on them. All they need are the decals which I plan on starting tomorrow. I hope all goes well because those decals are mighty tiny and I have big hands. Very nice start, I'm in and following! 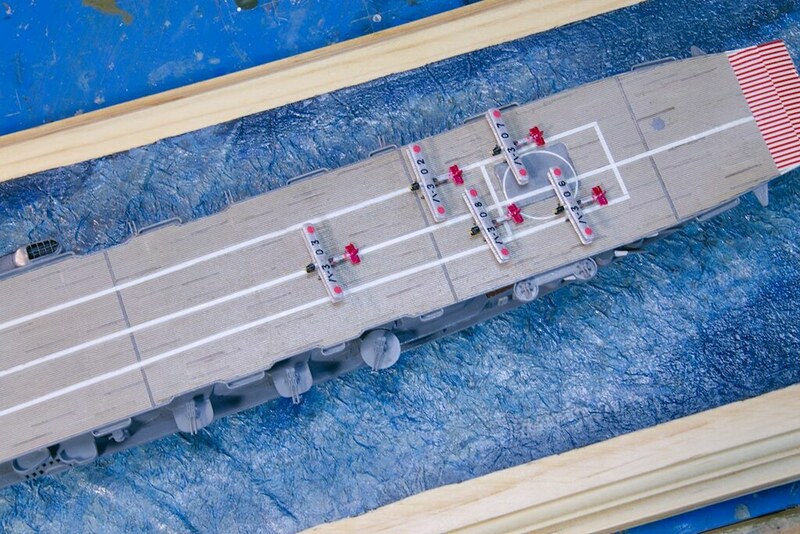 Well 1/700 IS small - all those tiny planes... Looks very promising though! I'm looking forward to follow your build! 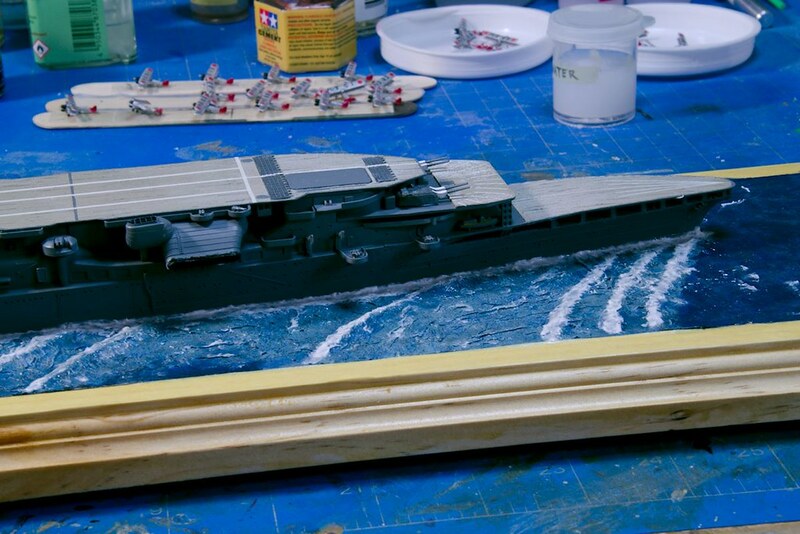 Finished up my last AFV for the year today and will focus on ships until the end of the year. 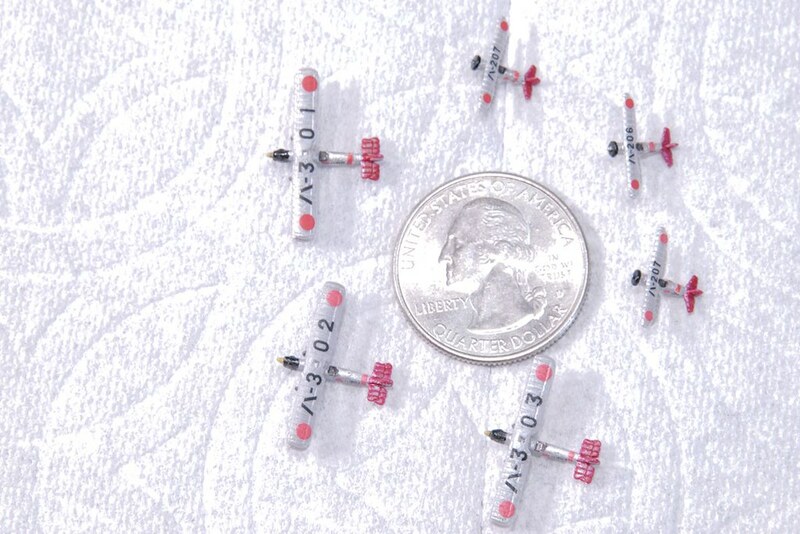 Can't believe how small those planes are: I'd go cross eyed trying to work on them!